Mercy SF started the game stronger than the last time Crystal played them. Mercy had clearly been working on the offsides trap and compacted the field into a tight 30-yard space. It took some time for CSUS to solve how to beat the offsides trap, but once they broke the offsides line, goals started coming. CSUS arrived in San Jose and saw a vast difference in field size compared to Crystal's home field. CSUS dominated the majority of the game and worked hard to get opportunities on goal, but alas could not finish. NDSJ definitely had home field advantage due to field size. The game finished with a 0-0 tie. Crystal started the game strong with an early unassisted goal by senior Meg D in the 5th minute, then quickly followed by another goal in the 9th minute by freshman Camille L, assisted by junior Marlena B.
Statistically, Castilleja and CSUS were evenly matched, but CSUS was ready to battle for the win. CSUS dominated the first half and had several attempts on goal, but couldn’t finish their shots. 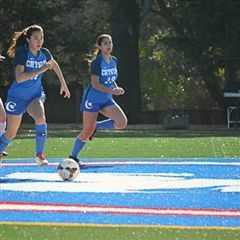 Then in the 35th minute senior Sophie M took a shot which Castilleja’s keeper could not hold on to, and junior Marlena B followed the shot and scored. The second half was a bit more challenging for Crystal with Castilleja seemingly dominating the chaotic half. Crystal was able to prevent Castilleja from scoring and finished the game with the win. CSUS started the game slowly, but got a goal in the 24th minute scored by freshman Nadia N assisted by freshman Reillly S. In the 34th minute, Reilly scored and was assisted by freshman Camille L. In the second half, senior Jayla A scored in the 57th minute assisted by freshman Kat K. The last goal came in the 78th minute by sophomore Amina A assisted junior Alyssa D.
Crystal started the game ready to play, going to goal. Harker answered speed and tenacity. The game was pretty evenly matched. The first half ended 0-0. Finally, in the 62nd minute of the game freshman Reilly S scored a goal, assisted by freshman Sophia D. After 80 minutes of playing in the cold rain, CSUS finished the game 1-0 against Harker. CSUS came out strong from the get-go against Lick-Wilmerding. The girls were evenly matched with the Lick-Wilmerding girls and worked hard for the win. A defensive mistake let L-W score in the first half. However, CSUS quickly returned with a goal of their own. Marlena B sent in a cross from the right side, and the ball bounced around; Soph O got to the ball and was able to finish and tie up the game. The second half brought more physicality with both teams fighting to get a second goal in. Kat K received the ball, dribbled a bit, took a shot and finished for a 2-1 victory. With each game, the Crystal team is looking stronger and more cohesive.